Paris is famous for so many things: love, lights, fashion and of course food! French food is rich, indulgent and beautiful. One of the best Parisian treats is of course the macaron (read all about their fabulous history here!) 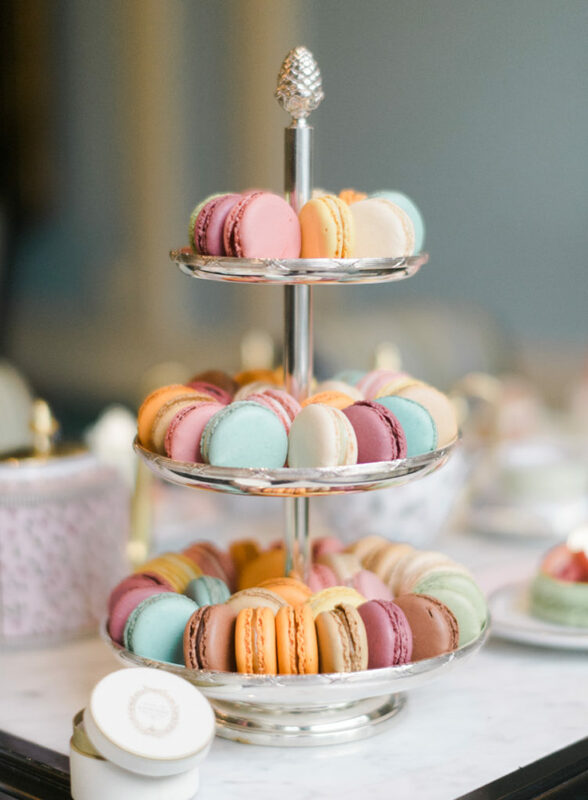 Macarons are exquisite pastries with a melt-in-your-mouth outer shell and a sweet, bursting interior that surprises the tastebuds with a contrast of hard and soft textures. Today Macarons are some of the most sought after delicacies in the world and the best place to find them is in Paris. From Ladurée to Angelina (and everything in between) get ready to swoon! Pierre Hermé was awarded the title of World’s Best Pastry Chef in 2016 by the World’s 50 Best Restaurants and was ranked 4th most influential French person in the World by Vanity Fair in 2016. If that’s not an introduction that says Pierre Hermé knows macarons I don’t know what is! Pierre Hermé is world renowned as the courtier of pastry and even has a book (Pierre Hermé Macarons: The Ultimate Recipes from the Master Pâtiessier) featuring the secrets of his sugary treats. 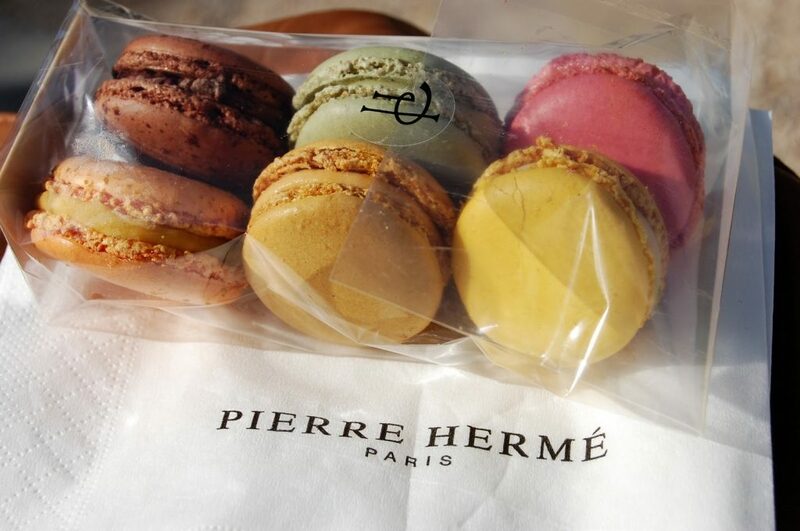 From Tokyo to Paris to New York, Pierre Hermé has truly perfected the art of making unforgettable macarons. Ladurée is one of the world’s best known sellers of premium macarons and was founded in 1862. 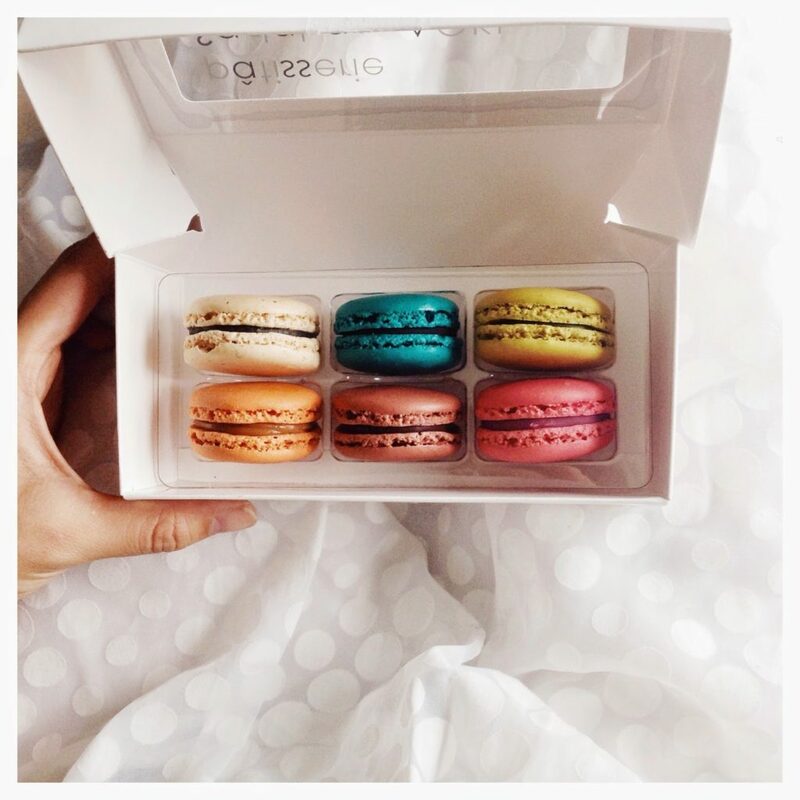 Light, fluffy and absolutely gorgeous Ladurée’s tiny pastries will make you wish you could eat macarons for ever meal. Famous flavours include coffee, salted butter caramel, chocolate, lemon, orange blossom, raspberry, rose petal and pistachio. Ladurée also has a range of delicious seasonal flavours to keep things fresh and fabulous. If you’re looking for the most classic macaron in Paris Ladurée cannot be missed! 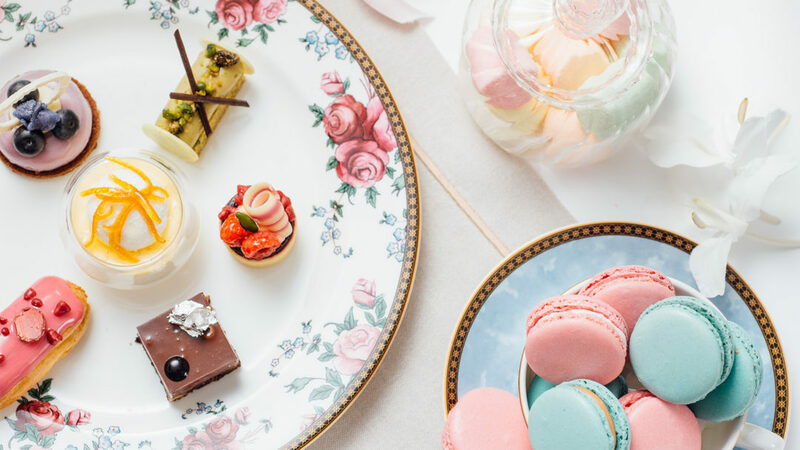 There are 3 Ladurée locations in Paris, but if you’re going to experience their iconic tea room make sure to make a reservation at their 21 Rue Bonaparte shop which was their first in France! Fauchon is the best contemporary French gourmet food delicatessen in Paris. Fauchon is recognized worldwide for its modern and sleek treats. Raspberry, Vanilla, Vanilla-Raspberry and Blackcurrant-Violet are the most famous macaron flavours at Fauchon. Simplistic and clean, Fauchon macarons are exquisite bite sized delights. 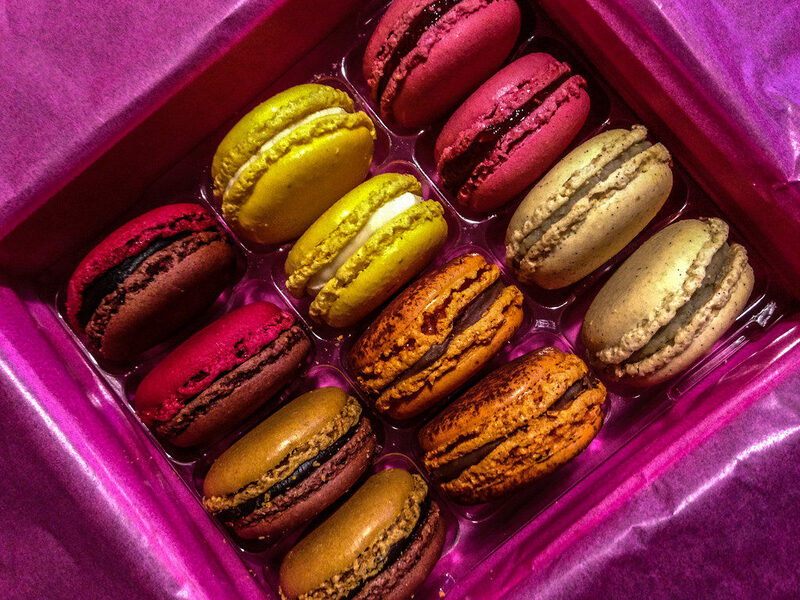 With two locations in Paris, 30 Place de la Madeleine and a small boutique at Gare de Lyon, Fauchon is a great place for picking up macarons on the go! Carette is one of the most charming places you can go in Paris for macarons. Located just steps from the Eiffel Tower, this classic patisserie does not disappoint. The look and feel of Carette is very traditional with a menu to match. 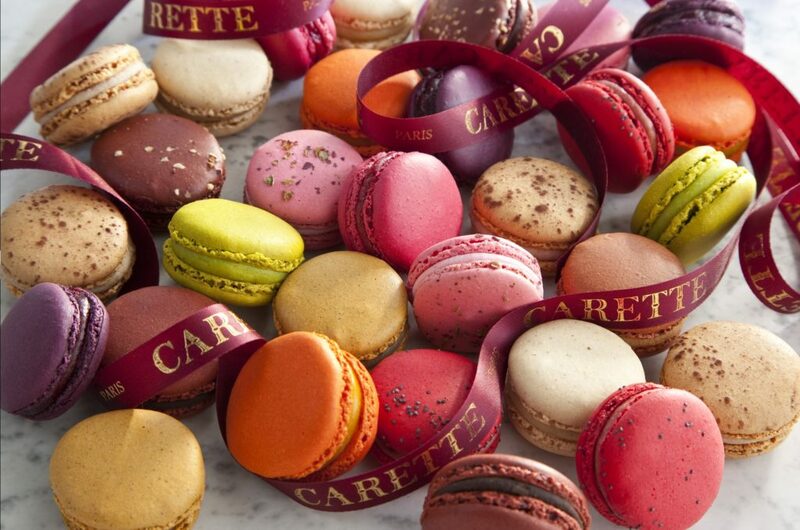 Stop by Carette for breakfast and follow up your mouthwatering meal with a macaron treat for the ultimate Carette experience! If you’re looking for French macarons with a Japanese twist look no further than Sadaharu Aoki. This patisserie offers a unique cultural fusion of Asian and European flavours. What makes these macarons a must try is the technique used by pastry chef Sadaharu Aoki which involves fusing traditional Japanese ingredients and flavours in French macarons. 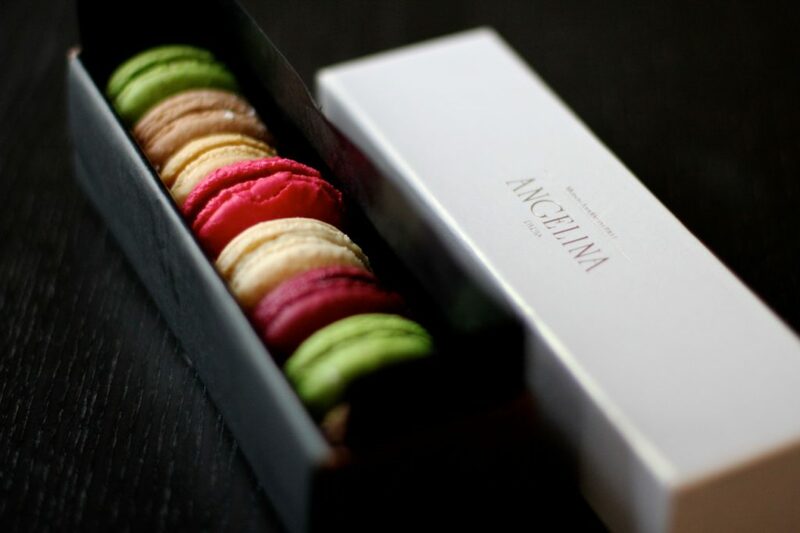 Sadaharu Aoki has a reputation for having a minimalist aesthetic while not compromising on the intricacy of French food. Some of the key flavours featured in Sadaharu Aoki macarons include yuzu, red bean, black sesame and of course matcha! Angelina is one of the tea rooms in Paris with the most glamorous and lavish histories. Famous for being a favourite hangout spot for Parisian elites including Coco Chanel and Marcel Proust, Angelina has an iconic history. 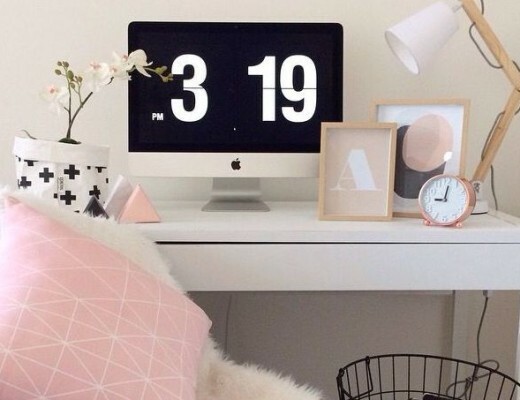 Angelina specializes in sweet treats and tea time and is located int the 1st arrondissement at 226 Rue de Rivoli. Macarons melt in your mouth and can’t be enjoyed without a silky pot of their renowned thick-as-can-be, rich-as-can-be hot chocolate. Each and every one of these Parisian macaron sellers will have you on cloud 9! If you’re not sure which shop will have your favourite macaron there is only one way to find out. Visit them all!